Many companies have begun to recognize the importance of having an IT asset management (ITAM) process in place for software asset management (SAM), employing techniques like license harvesting to reduce unnecessary company spending. However, hardware asset management (HAM) is still often overlooked. This is a costly mistake, as tracking the end-of-life data of hardware assets will help companies plan ahead, save money, and increase productivity. 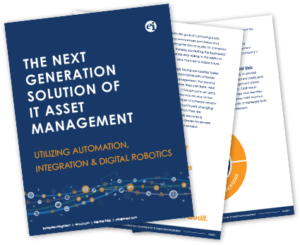 When it comes to ITAM, hardware asset management goes hand-in-hand with SAM. Any new software needs supported, maintained hardware in order to function correctly. Therefore, it is imperative that all asset management plans include a way to manage the lifecycle of your hardware assets. As part of lifecycle management, original equipment manufacturers (OEMs) will declare hardware assets as end-of-life (EOL) status after a given period of time. The reason is that as OEMs release new products, it becomes increasingly more expensive to support older products. Instead, they begin to focus on maintenance and support for their newest hardware assets. Once hardware assets are declared to be end-of-life, support will become quite expensive, if it is available at all. Because of this, companies need to be able to forecast ahead of time what hardware assets will need to be replaced and when. By using EOL programs that track the stages of the hardware’s lifecycle, companies can ensure that their systems are fully supported and maintained across the board and will decrease the likelihood of security risks. At first, you might consider continuing to use hardware assets beyond their lifecycle to save money; however, this can create multiple problems. Data security will be compromised, work done on the older hardware assets will be less productive, maintenance costs will be higher, and furthermore, doing so would be out-of-compliance with the OEM’s regulations. In fact, it is always in your company’s best interest to retire old hardware assets as part of your ITAM process in order to receive a better return on investment (ROI). You could potentially re-sell hardware assets to an organization that can refurbish them (such as recycling companies, charity organizations, or schools) while keeping in mind that all data should be wiped before re-selling the hardware. There will be less time wasted in hardware asset management because having a successful hardware asset management process in place will speed up Service Level Agreements (SLAs). Effective hardware asset management processes can save the company money on maintenance costs, hardware asset budgets, and software spending. HAM tools track end-of-life hardware assets and prevent slowdowns or expensive mistakes. By keeping track of which hardware assets are reaching end-of-life, you will avoid any nasty surprises. For example, if you have not automated your ITAM processes, you may not notice when your company’s computers reach end-of-life until it’s too late. This oversight would leave your entire organization scrambling to replace hundreds or thousands of hardware assets suddenly and at great cost. Replacing hardware assets before the situation becomes critical allows you to upgrade in a timely manner and save your company millions of dollars. It is also easier to re-sell hardware assets for a greater financial return if your company takes the steps to do so early in the EOL process rather than later. Replacing non-compliant hardware not only saves money but safeguards your organization as vendors seldom release security patches for outdated hardware. End-of-life equipment maintenance is expensive enough, but should data be leaked or lost because of EOL hardware, your company will pay an even greater cost. Enterprise Integration, in our partnership with Eracent, offers automated solutions that help customers track hardware and software assets. Eracent’s IT-Pedia® aggregates all hardware and software data in one place which will allow you to access and view data and generate reports quickly as part of your operations strategy. With Eracent’s offerings combined with Enterprise Integrations’ Service Delivery IntelligenceTM (SDI), companies can discover, map, and visualize all core components and know the health of the total business technology supply chain.